The leaders from the 21 countries represented at the Asia-Pacific Economic Cooperation (APEC) summit found a colourful welcome in Papua New Guinea, but the high-stakes trade conflict between the U.S. and China was spelled out in black and white as soon as talks got underway Saturday. Before the leaders even gathered for their first family photo, Chinese President Xi Jinping and U.S. Vice-President Mike Pence gave back-to-back speeches to an APEC CEO Summit taking place in Port Moresby to coincide with the leaders talks — an audience keenly aware of how disruptive the hundreds of billions of dollars in tariffs applied over the last year have been to global supply chains, at a risk to both investment decisions and consumer confidence. Anyone hoping for a conciliatory tone from the U.S. in President Donald Trump's absence was quickly disappointed. 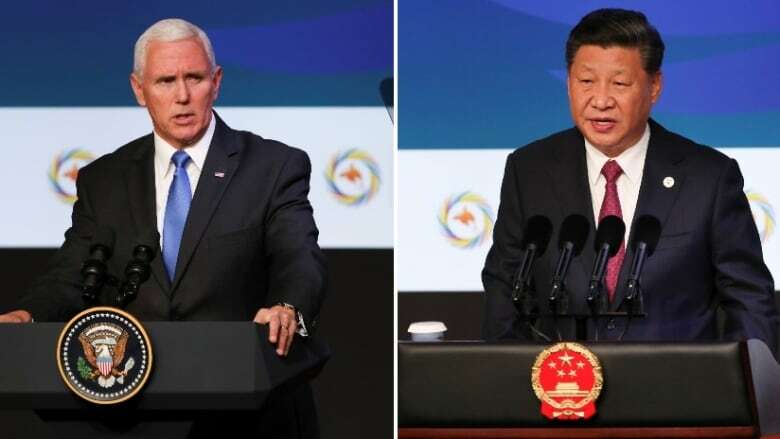 "We hope for better, but the United States ... will not change course until China changes its ways," Pence told the CEOs. 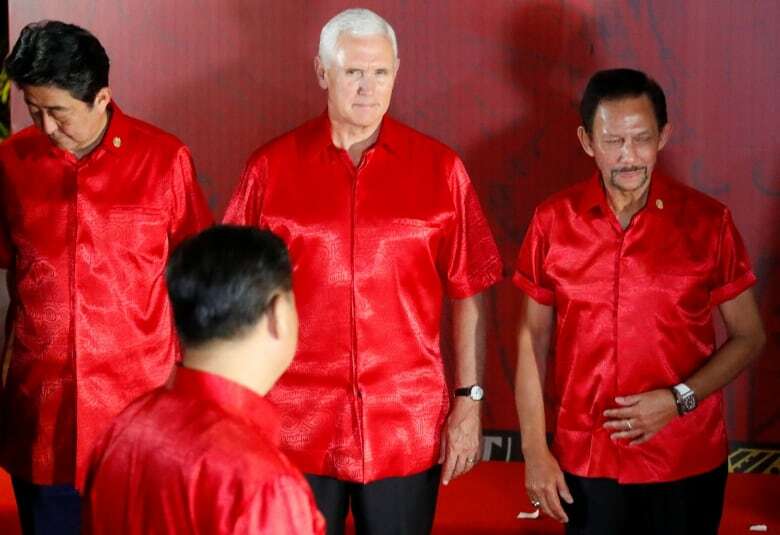 Pence made no apologies, emphasizing instead the military and infrastructure investments the U.S. was making in the region — investments that compete with the now highly visible presence of China. This strategic game between the world's two biggest economies is evident in Port Moresby, the capital of APEC's poorest country. Signs identify new infrastructure as "China Aid" and advertise the "co-operation and peace" it's meant to signal in both English and Chinese. The road to Papua New Guinea's seat of government is newly paved by the Chinese. A Chinese investment also helped build the Hilton Hotel where the APEC leaders enjoyed their gala dinner Saturday night. Pence tried to portray what the U.S. is doing in the region as more honourable than the Chinese initiatives. "We have a principled approach that stands in stark contrast to other nations," he said, saying others offer opaque loan terms for unsustainable projects that come with strings attached. "Do not accept foreign debt that compromises your sovereignty," Pence warned. "Be just like America, and put your country first." "We don't offer constricting belts or a one-way road," the American leader said, in words chosen to reference a centrepiece of Chinese foreign policy: its "belt and road" initiative to build land and sea infrastructure that positions the massive Chinese market at the centre of trading networks across Europe and Asia. In a speech to the same audience, Russian Prime Minister Dmitry Medvedev said Russia is willing to work with China on this initiative. One of the joint outcomes from last weekend's visit to Beijing by Finance Minister Bill Morneau and International Trade Diversification Minister Jim Carr was a commitment from Canada to send a "high-level" delegation to the 2019 Belt and Road Forum for International Co-operation. Canada hasn't previously attended this Chinese-organized event. 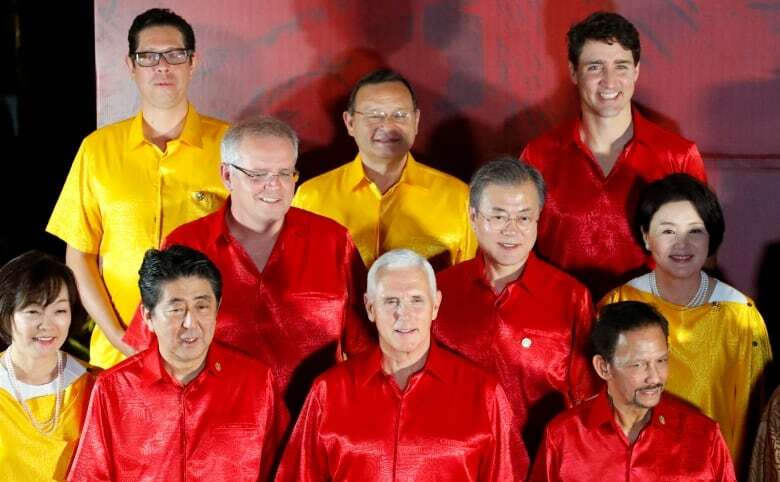 A spokesperson for Carr said this "high-level" delegation is unlikely to include Canada's prime minister. In a contrast that would have seemed unimaginable even two years ago, it has fallen to the Chinese president to make the case for multilateralism and rules-based trade, in comments supportive of efforts to reform the World Trade Organization. Xi said that erecting trade barriers is against the trend of history. "Old practices" like unilateralism and protectionism won't solve problems, he said. China's setting its sights on "post-2020 co-operation." "History has shown that confrontation, whether in the form of a Cold War, hot war, or trade war will produce no winners," Xi said, calling for conversation instead. "He's trying to mend fences here, and then you have Vice-President Pence coming in ... and taking an incredibly hard tone against China," said Jonathan Pryke, director of the Pacific Islands program at the Lowy Institute, a non-partisan Australian think-tank. "It's worrying where this is all leading, because it doesn't seem like there is much room for conversation or middle ground to be found." Championing rules-based trade is one of Trudeau's priorities for APEC. All three of the bilateral meetings the Canadian prime minister has scheduled are with partner countries in the Comprehensive and Progressive Trans-Pacific Partnership (CPTPP) — the 11-country Pacific Rim trade deal that takes hold Dec. 30. The first country Trudeau met with Saturday — Malaysia — has yet to ratify the CPTPP. Canada is urging Prime Minister Mahathir bin Mohamad's government to do so and start realizing its benefits. The two leaders also discussed liquid natural gas (LNG) development on Canada's West Coast. Malaysian-owned Petronas is an investor in the project. On Sunday, Trudeau will meet with Japanese Prime Minister Shinzo Abe and Australian Prime Minister Scott Morrison. Pryke thinks a change in government has erased the hard feelings Australia voiced after Canada wouldn't commit to the CPTPP at last year's summit. This year, the two countries are caught in the middle of the heated rhetoric of the U.S.-China confrontation. "It's quite disturbing for a lot of middle powers who have ... relied on the U.S. to protect the liberal order that the U.S. helped create," he said. "It's worrying to see that they're retreating from that narrative pretty aggressively." That makes an APEC focused on trade and economic integration important. "But it also makes it so much harder to get anything done, because the biggest powers in the room aren't all that interested in liberalization and integration," he said. "We have to rely less on our relationships with the big players and we have to work more closely with people in the middle," Pryke said. 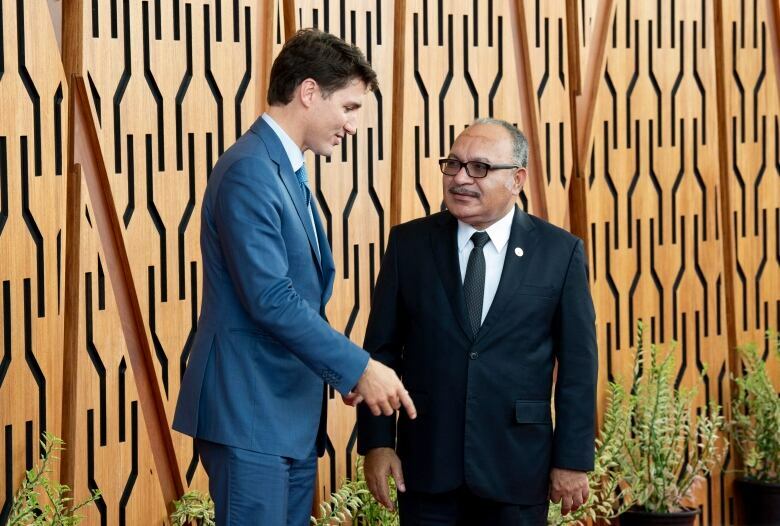 Trudeau's other meeting Saturday was one Canada organized with leaders from Pacific Island nations. Part of Canada's commitment at the Paris Climate Conference was $2.65 billion to help small island states. As part of Canada's G7 presidency, it's been talking to small island states about ways to finance climate-resistant infrastructure in the developing world, Trudeau said before the meeting. "Increasing sea level has diminished the land we have to live on, increasing the salinity of our water that impacts on our food security," said Baron Waqa, the president of Nauru, an island country in Micronesia. "The disappearance of our land could threaten our very sovereignty."